How much do you know about what happens to the water you use after it goes down the drain? We spoke to Nick Hansen, a wastewater treatment plant operator, about the other side of our water use and how wastewater plants are helping with drought solutions, such as producing recycled water. A lot of people don’t give much thought to the water that comes out of their tap as long it tastes good, it’s plentiful and it’s cheap. And probably fewer care about where their water goes when they’re done with it. Down the drain is out of sight and out of mind. 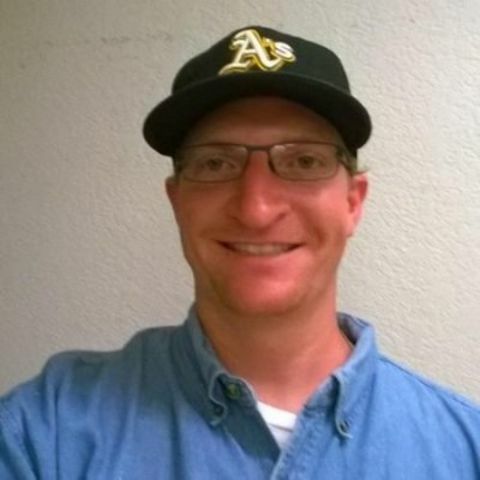 Hansen works as a senior wastewater treatment plant operator at Central Contra Costa Sanitary District . He also started the blog RecycledH2O.net , which provides information about using recycled water. In particular, he’s been a source of much-needed information about refill stations , which are popping up across the state to provide (usually) free recycled water from wastewater plants that can be used for landscape irrigation. Hansen talked to Water Deeply about why recycled water is so important, how the drought has impacted wastewater treatment operations and the one thing he really wishes people would stop putting down the drain. Water Deeply: What’s a typical day like at your plant? Nick Hansen: A normal day starts with a shift change; you find out what’s gone on during the previous shift. We are a 24-hour operation, so someone is there all night. We process about 36 million gallons of wastewater a day – that is a drought-reduced number. Of that we then burn about 200,000 pounds of sludge a day and we are the only treatment plant left in California, I believe, that burns sludge. Water Deeply: What does everyone else do with it? Hansen: They put it in a digester; it’s an egg or cylindrical-shaped tank, and they let it gasify to create methane and they use that methane to power some kind of resource in their plant. Water Deeply: Is burning it the ideal thing to do? Hansen: For us, it has worked for 40 years. We capture the waste heat to generate steam; we use steam to run other areas of our plant, which becomes our energy savings. Our plant is a wastewater plant but it shares a lot of the same technologies as a refinery, which is not standard for a wastewater treatment plant. Water Deeply: What process does wastewater go through at your plant? Hansen: Water comes in and goes through a facility where we have a couple of screens that rake up any material that’s in the flow that doesn’t fit through a three-quarter-inch [2cm] gap. We then pump that to a primary sedimentation tank, where whatever floats is called scum – that’s fats and greases, that’s plastics, condoms, wrappers, a lot of trash. Flushable wipes sometimes rise to that surface. We skim that off and we’ll use that scum as fuel for our fire. The other side of that is the sludge, which sinks and is scraped off the bottom and pumped to a holding tank. That mass of water then goes to our secondary process called aeration. It’s basically activated sludge with little microscopic bugs. The bugs eat it all up, they get fat and happy, then it goes to a final clarifier where the bugs sink and the clean water goes over some weirs. That water then goes through a U.V. disinfection and then it’s gravity fed to the [San Francisco] Bay. The sludge is centrifuged and pumped in the furnace. The furnace is a continuous process, so about 200,000 pounds [90,700kg] of sludge turns into about 28,000 pounds [12,700kg] of dry sterile ash that is trucked to a grass application fertilizer company. That’s our reuse. We give away the ash. Water Deeply: And you also have recycled water? Hansen: In the winter time, recycled water demand is fairly low, but in the summer time it takes off. We provide recycled water to irrigate golf courses, residential street medians, things like that. Water Deeply: How does recycled water get from you guys to somewhere like a golf course? Hansen: We build a pipeline; we have been in the process of building pipelines as funds are available. We definitely see the demand at the plant. Water Deeply: Is the water that’s going to golf courses of the same level of quality as what’s released in the bay, or is there an extra step? Hansen: There is an additional step, a tertiary treatment process. It’s monitored 24/7 and we follow rules set up by the state. It’s definitely cleaner; you can tell the water quality change between what goes into the bay and what goes out as recycled water. Water Deeply: What kind of impact have you seen on your operations with the drought? Hansen: The flow is down, that’s for sure. We saw a 12-million gallon-per-day drop. Less water, same amount of solids. It’s made things interesting. Water Deeply: Is there anything you want people to know about wastewater or wish they would do differently? When it’s raining we get an increased amount of flow and with that anything that’s been stuck in the pipe for a year or two is now coming to the treatment plant. The big public outreach is to stop using the toilet as a trash can, but I think it’s more than just the toilet, it’s also the kitchen sink. We’re still going to process it, we’re still protecting the environment and public health, but now we don’t have to deal with all the trash that’s in the pipe. Water Deeply: You were instrumental in getting a refill station for your plant so that recycled water could be made available to local residents. How is that going? They opened in October of 2014 and the first two or three months no one showed up. It was raining and demand was low then. But by February 2015 there was no more rain coming down and more people were interested. But people need tanks for their vehicles to transport it, and they were wondering how you do it, so that’s when I started a blog to show the tank options for vehicles, and pumps, and how to unload it and a map of where to find it. From there, as it got hot, it really started taking off. If you drove anywhere on the I-680 corridor you saw someone with a 275-gallon tote in the back of their pick-up truck and everyone is hauling water. Water Deeply: What are people using the water for? Hansen: Mostly watering the lawn. If you have a 25 to 35 percent water conservation requirement, the landscape uses like 60 percent of your water. Water Deeply: Is there anything you shouldn’t be putting it on? Hansen: Don’t put it on your food, don’t drink it, don’t give it to your pets. I have some plants that can handle recycled water and some that just can’t stand it [because of the salts]. I published a chart on my blog about ones that are sensitive to it. Water Deeply: Are the stations totally free or is there a cost? Hansen: Almost every one of them is free. Some of them charge $5 to cover costs for their administrative training. Generally you have to live in the service district. Dublin San Ramon is the only fill station in the state that doesn’t require you to live in the service district. 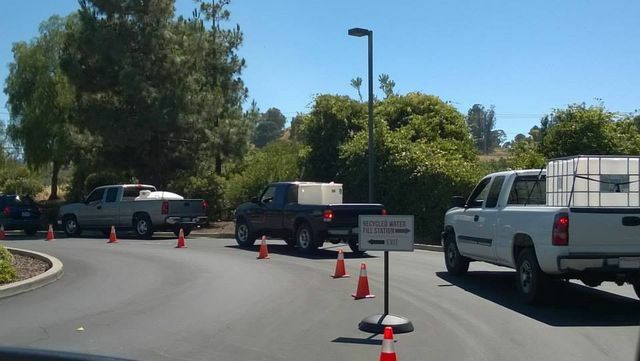 That’s why you hear news stories about someone from San Jose who is watering the local sports fields by driving the hundred-or-so-mile round trip three times a week for recycled water. Water Deeply: Do you think interest in recycled water will continue after conservation mandates are lifted? Hansen: I think so; someone told me even if the drought is over he still wants to haul recycled water – the benefits for his yard are immense. He said his water company charges him a lot for the water he gets. And a lot of people have said their grass is so green on recycled water. We’re going to be in a drought again this summer. Recycled water stations are available. It’s a way to meet your neighbors. The biggest thing is raising the awareness of recycled water. This version corrects an earlier version of the story in which it was reported that Delta Diablo closed its refill station because it had no more available recycled water to give away for free. In fact, the station closed only for the winter because irrigation water is not in high demand during the rainy season.